Consumers are bombarded with food marketing that puts lots of tasty (some would say addictive) food at their fingertips. And increasingly, that marketing relies on claims that the food is healthy to prompt people to eat it. But our research suggests that consumers have become confused and cynical about these claims. 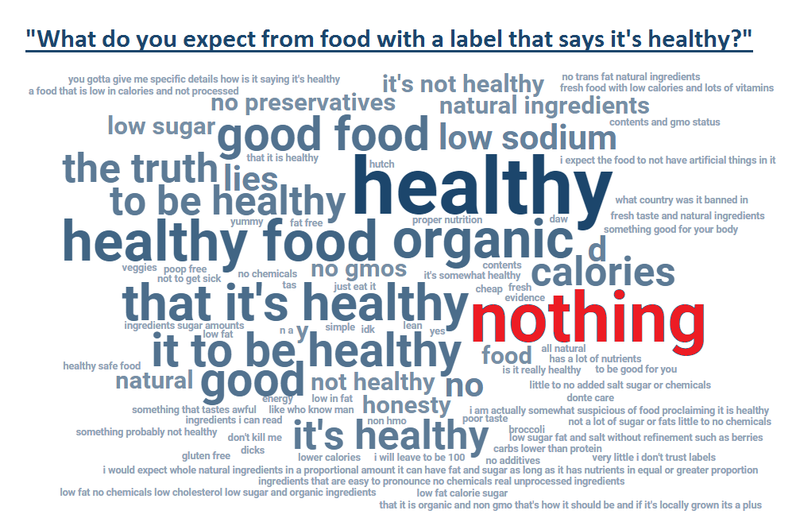 As the word cloud above illustrates, many consumers say they expect “nothing” from a food product with a label that says it’s healthy. 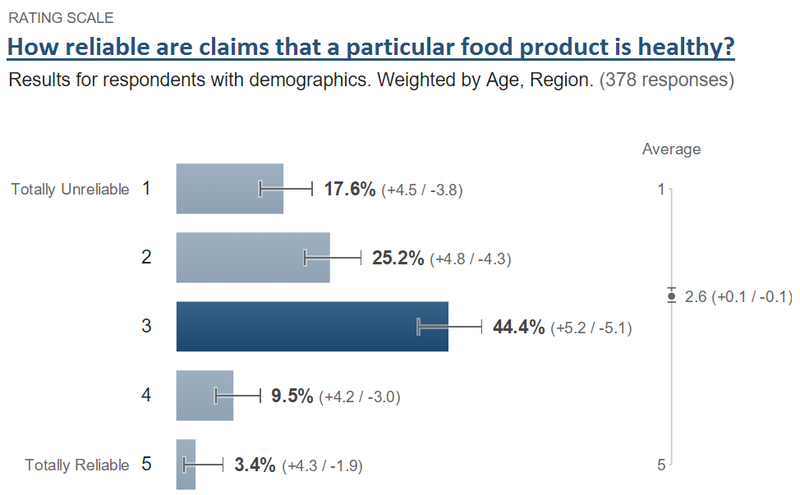 Perhaps more significant is the finding that 87% of consumers don’t believe that health claims for food products are reliable. We’ve had similar observations in our clinic. People come in to lose weight and they report eating “healthy.” We find a schism between what they are doing and what they think they are doing. It’s about beliefs regarding what is healthy. We see a lot of confusion and skepticism. 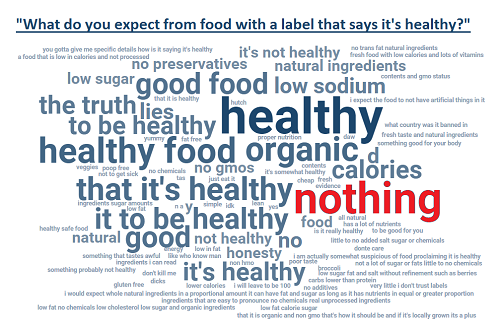 Savvy marketers are coping with this skepticism by making indirect claims about the healthfulness of their products. GMO-free, antibiotic-free, gluten-free, and an assortment of other such claims let the consumer infer a health benefit. 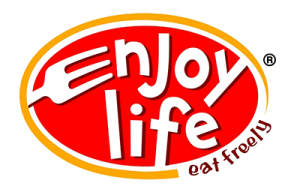 Mondelez International International, marketers of Double Stuf Oreo cookies, told investors recently that it is becoming “a global leader in well-being snacks.” Toward that end, Mondelez acquired Enjoy Life Foods earlier this year for an undisclosed price. Marketing the concept of “free-from living,” Enjoy Life makes its products free of wheat, dairy, peanuts, tree nuts, egg, soy, fish, and shellfish. 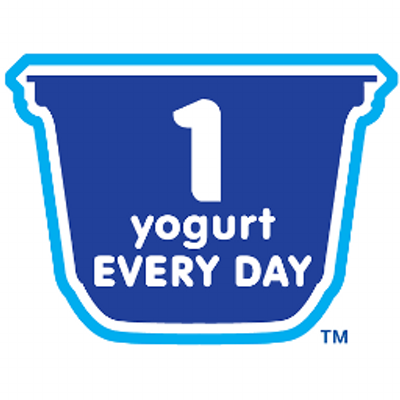 Likewise Danone, a leader in the yogurt business, is doing everything it can to exploit the assumption that yogurt is a healthy choice with its 1-Yogurt-Every-Day™ campaign. Some of their yogurt products offer excellent nutrition. Others are more like sugary desserts. Regardless of a product’s quality, food marketing bent upon driving people to eat ever more servings of a product will come to a bad end. It will ultimately drive people to consume more than is needed for good nutrition and undermine, rather than enhance, health. Our bodies store the excess calories and set the disease of obesity in motion. This is why “eat more, it’s healthy” is not a sustainable strategy. Beyond a point, food marketers render health claims meaningless, poison the well, and make consumers skeptical of the entire industry. Click here, here, and here for more background on food health claims. Food producers are out to make money not health. They are great at marketing and physiology. However, they are sensitive and susceptible to demand. And food is essential to consumers. So we cannot ban food. Consumers need food producers and food. While flagrant abuses of health claims can be outlawed, the real solution is for the people interested in health to educate the consumers ( see the results in SSB’s) and to use marketing techniques to make healthy profitable. Yup – easy for me to say. We have work to do. You make good points, Allen. Food producers will have to be part of the solution because regulation of marketing practices is clumsy at best and counterproductive at worst. Perhaps the threat of regulation and taxation are necessary to get there, but food producers have contributed to this mess and they will have to help clean it up. We have no techniques to measure people’s healthiness, we can only measure illness. As a result, it is not possible to make any science based claims about healthiness of people, or of foods. Food content labels are entirely based on studies of illness. Interesting perspective, Tracy. Thanks for sharing it.